This infrared image of the nearby galaxy Messier 83 was taken by ESO’s Very Large Telescope (VLT) at the Paranal Observatory in Chile. A European telescope has used infrared vision to pierce theveil of dust around the galaxy Messier 83, and revealed clusters of young starshidden within dusty regions that harbor star factories. The new galaxy photo comes courtesy of the HAWK-1 camerabelonging to the European Southern Observatory's Very Large Telescope (VLT) atthe Paranal Observatory in Chile. Such findings help astronomers seek out theyounger star clusters in order to better understand the birthand evolution of stars. An infraredview not only eliminates makes much of the dust effectively transparent,but also tones down the brightly lit gas that tends to hang around hot youngstars. Binocular-wielding stargazers already know Messier 83 as oneof the brightest nearby galaxies. The galaxy is located 15 million light-yearsaway from Earth and spans over 40,000 light-years, where a light-year is thedistance light travels in a year, about 6 trillion miles (10 trillion km). Messier 83 also looks like a strikingly similar twin to ourMilky Way galaxy with its spiralshape and bar of stars across the center, despite having just 40 percentthe size of the Milky Way. 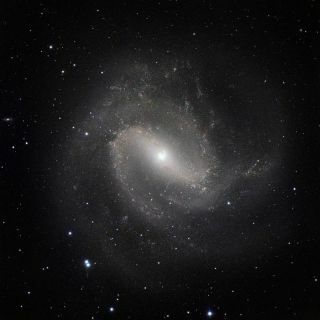 Astronomers recognize Messier 83 for its record-breakingnumber of observed supernovas that mark the end of many a star's life. Just oneother galaxy can match that record.